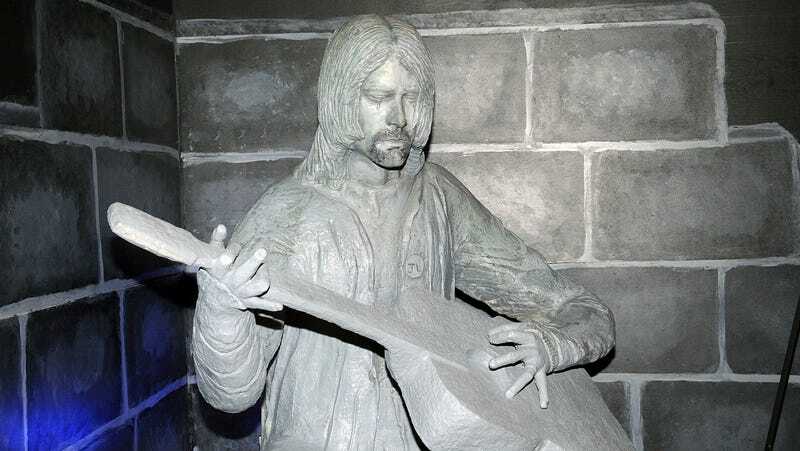 A statue of Kurt Cobain, on display at the Aberdeen Museum Of History in 2014. It’s not clear if the statue survived the fire, but Jesus Christ do we hope it did. Because not even the tiniest, most minute part of Kurt Cobain’s legacy can go untarnished for long, NPR reports that a museum in the Nirvana star’s hometown, which included an exhibit devoted to him, has been hit by a fire. It’s not entirely clear how much damage the Aberdeen Museum Of History suffered, but it reportedly took 77 firefighters more than 10 hours to quell the blaze, so we have to assume it was extensive. Specifically, it’s unclear how much of the museum’s Cobain memorabilia—including one of his friend’s couches where he once crashed for a while, a real thrill for people anxious to bask in front of upholstery where the grunge legend once napped—has been destroyed. Despite Cobain’s frequently stated antipathy for his hometown, Aberdeen—located about 80 miles southwest of Seattle—has embraced its famous former resident with all the zeal of, well, a small town that tangentially found itself stumbling into a tourism-friendly claim to fame. The city’s welcome sign includes a “Come As You Are” motto, and there are plaques all over the city commemorating the many places where Cobain unhappily grew up, the better to help Nirvana pilgrims navigate. Amazingly, this isn’t even the biggest bummer in “Kurt Cobain’s old stuff” news from the last month, though; a lawsuit from his daughter’s ex-husband, centered on an alleged kidnapping plot intended to extort him into giving back one of Cobain’s guitars, is still working its way through the courts. No one was harmed in the fire, according to reports.